Today in Rome we see the canonisation of seven new saints including Saint Oscar Romero and Saint Pope Paul VI. As Pope, Paul VI over saw much of the Second Vatican Council, which had been opened by Pope St. John XXIII, and in 1969 promulgated a new Roman Missal. He died in 1978, and was beatified by Pope Francis on 19th October 2014. Clare Dixon, CAFOD’s Head of Region for Latin America, who supported Romero’s church in the 1970s, said: “Oscar Romero is revered in his native El Salvador. He ranks alongside the likes of Martin Luther King and Mahatma Gandhi as one of the most remarkable figures of the twentieth century. 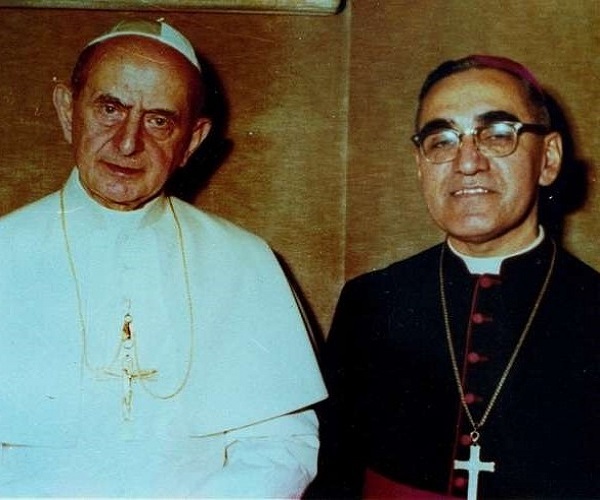 Please join us to celebrate the canonisation of Oscar Romero on Tuesday 23rd October with Mass at 12.10pm, at Salford Cathedral with Bishop John.